Sarna is the Joseph H. and Bella R. Braun professor of American Jewish history at Brandeis University and the author of the 2004 book American Judaism: A History, and 2012’s When Grant Expelled the Jews. His co-author is Benjamin Shapell, founder of the Shapell Manuscript Foundation, which accumulated many of the rare handwritten letters and images documenting Lincoln’s relations with Jews, and that are reproduced in the book. 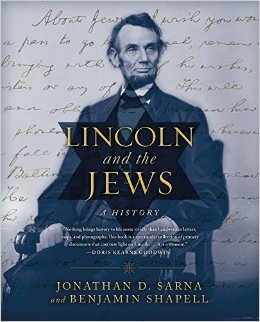 “My book is more of a narrative,” Sarna explains, “telling Lincoln’s story through Jewish eyes.” As he describes in the book, from his early days in Illinois through his presidency, he connected with Jews, representing them legally, consulting with them, defending them, using a Jew as a secret agent, attending Jewish-themed plays, and in one striking action, revoking Grant’s ill-conceived expulsion of Jews from territory he controlled. Lincoln’s contacts with Jews progressed as he grew to know more of them, starting from his early schooling where he learned about Jews from the Bible–which he often quoted–to his relations with Jewish lawyers and shopkeepers in Illinois. Abraham Jonas, Lincoln’s first close Jewish friend whose correspondence with Lincoln is reproduced in the book, was both a lawyer and political ally in Springfield and Quincy who campaigned actively for Lincoln’s nomination as the Republican candidate for president.